Did you know that ‘tej patta’, an aromatic leaf used for cooking biriyanis, kheer, masala tea and so many other exotic dishes belongs to the laurel or ‘Lauraceae’ family? Though many of the evergreen shrubs and small trees that belong to this family are also called “laurels” the name is mainly given to Laurus nobilis, also known as sweet bay or bay laurel. Though it was originally found in the Mediterranean region, it is now widely cultivated in most parts of the world. Many call it the bay leaf tree. It is grown commercially for its aromatic leaves in Turkey, Algeria, Morocco, Portugal, Spain, Italy, France, Mexico and many other places. In India, "bay leaf" usually refers to the cassia tree (Cinnamomum cassia) which also belongs to the laurel family. There are many stories about the laurel tree. People in ancient Greece believed that the tree was the favorite tree of Apollo, the Greek god. The story goes that when Apollo chased the nymph Daphne she was changed into a laurel tree in answer to her prayers. Ever since, Apollo wore a wreath of laurels in memory of Daphne. Apollo is supposed to have said that the laurel would be the emblem for poets and winners. So athletes who won contests in the Olympic Games were crowned with a wreath of laurel leaves. So did poets who were considered to be especially good. You may have heard the term “poet laureate”. The expression means “crowned with laurel”. This is also where you get the expression “resting on your laurels” from. The bay laurel grows to a height of up to 60 feet. It has stiff, oval leaves that look somewhat leathery and are quite thick. The leaf edges are smooth and often curly. The tree has small greenish white flowers and blackish berries with one seed. Other varieties of laurel include tough and hardy evergreen shrubs. They are among the prettiest of wild shrubs. You may have seen masses of pink, crimson, or white laurel flowers covering the entire mountainside. Or you may have marveled at the way the shrubs brighten up a drab place with color. The laurel flowers grow in clusters. You find many kinds of laurels in North America. Some of them belong to the heath family, Ericaceae. Mountain laurel grows in the mountains of North America. The shrubs often grow to a height of 20 feet. They have thick clusters of pinkish-white flowers that grow at the ends of the branches. The leaves are large and leathery. They are a bright and glossy green, smooth-edged, and pointed at both ends. Sheep laurel, or lambkill is much smaller than mountain laurel. It grows in swamps and wet pastures. You also find them around the Pacific coast. They have crimson flowers that cluster around the stem. The laurel family includes sassafras, camphor, and spicebush, or wild allspice. All of them are trees and shrubs that are noted for their scents. 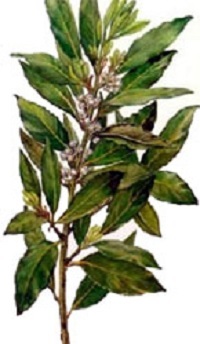 A sweet scented oil is made from the berries and other parts of the sweet laurel. The oil is used for making toilet waters and perfumes, soaps and candles. Dried bay leaves are used for flavoring in many kinds of cooking, especially Indian dishes. They are often an essential ingredient in ‘tarka’ or seasoning. Sometimes people make small bundles with bay leaves, parsley, thyme, cloves, cinnamon and other herbs and put the bundle in the dish while it is cooking to give it an attractive flavor. These bundles are called bouquet garni and are removed after cooking. Some also use bay leaves in pickles. Some of you may be lucky enough to have a bay laurel tree in your garden. You should remember to pick up the leaves early in the morning and dry them under weight so that they don't curl. After that they should be stored in an air-tight container. Perhaps you might be able to think up new ways of making use of laurel leaves? Why not try?